Stapleton, GA – Mildred Dean Shelton Coxwell, 87, loving wife to the late Roy Lee Coxwell, entered into her eternal rest Sunday afternoon, March 17, 2019 at Gibson Health and Rehabilitation Center. Services to celebrate her life will be held in the James Funeral Home Chapel at 2:00 P.M. Thursday afternoon, March 21, 2019 with the Reverend Ronnie Shelton officiating. Interment will follow in the Bethel United Methodist Church Cemetery in Gibson. 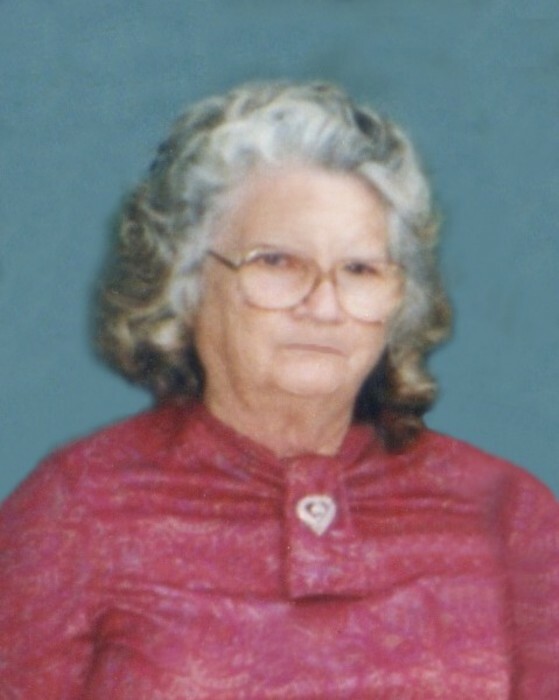 The only girl out of nine children born to the late Ollie Swint Shelton and the late Daniel “Tucker” Shelton, Mildred grew up in Gibson and attended Glascock County School. As a young girl, she accepted Jesus as her Lord and Savior, serving him as a member of Bethel United Methodist Church and then at Wrens Nazarene Church. Mildred married and started her family at a young age. She worked as a seamstress at Stapleton Garment Company for 28 years before having to leave due to her health decline. Mildred was very industrious—a hard-worker who was always busy. She enjoyed going fishing, cooking for her family and sewing. Having a fun-loving spirit, Mildred had a great sense of humor which attracted people to her. Her first priority was her family—she loved being a homemaker and made their home a loving, comfortable safe haven. Mildred stored her treasures in her family—not in the stuff of this world—loving them unconditionally. Her grandchildren’s memories of them riding bicycles picking up aluminum cans, watching wrestling and Kung Fu movies on TV will be forever in their hearts. Mildred has now gone home, leaving a void that no one can fill; but her love has left memories that no one can steal and that will sustain her family until they meet again. Mildred is also preceded in death by all eight of her brothers, Infant Boy Shelton, Ollie Gene Shelton, Moses Shelton, Lester Shelton, Daniel Shelton, Gene Shelton, Thomas Shelton and David Shelton. Survivors include her three children, Roger L. Coxwell (Alice), Gloria D. Amerson (Detroit) and Ollie R. McCullar (Tony Wheeler); five grandchildren, Billy Coxwell, Wendy Sims, Detroit Amerson Jr. (lana), Jeffrey Amerson (Jessica) and Tracy T. Kitchens (Renee); twelve great grandchildren, Kellie Coxwell, Karie Coxwell, Heather Goddard, Amanda Sims, Bobbie Lynn Sims, Peton Amerson, Chanler Amerson, Presley Amerson, Jeffrey Amerson Jr., Shelton Amerson, Breana Kitchens and Amber Kitchens; two great-great grandsons, Tyler Rushing and Kevin Drake Jr; three sisters-in-law, Betty Shelton, Janelle Shelton and Sara Shelton; nieces, nephews and many friends. Pallbearers will be Jeffrey Amerson Jr., Billy Coxwell, Joe Kitchens, Larry Kitchens, Ken Kitchens and Tracy Kitchens. Serving as honorary pallbearers will be Thomas Shelton and Roy Wheeler Jr. The family respectfully requests that in lieu of flowers, memorials in her honor be made to the Alzheimers Association, 106 SRP Dr, Evans GA 30809. Heartfelt thanks and appreciation are expressed to the staff of Gibson Health and Rehabilitation Center and Affinis Hospice for their compassionate, loving care. The family will receive friends at James Funeral Home from 6:00 – 8:00 P.M. Wednesday evening, March 20, 2019. Strong and healthy once again.